Each year the who’s who of young libertarian and classical-liberal activists descend on Washington, DC, and they recognize their most successful peers. The highest honor of the 2015 International Students for Liberty Conference, for an individual “alumnus” or role model, went to whistleblower Edward Snowden, but the budding Honduran branch of the international organization garnered victory for the event of the year. The final awards ceremony of the three-day event was on the evening of Valentine’s Day at the Marriott Wardman Park Hotel, with the two remaining prizes for the student and group of the year: Ana Jakšić of Belgrade, Serbia, and the African Liberty Student Organization at the University of Ibadan in Nigeria. The specific student activism that earned recognition, “We Want Classes,” took place in San Pedro Sula. The initiative merited attention because it foiled a hijacking of the Valle de Sula campus of the National Autonomous University of Honduras (UNAH-VS), and it attracted new allies. 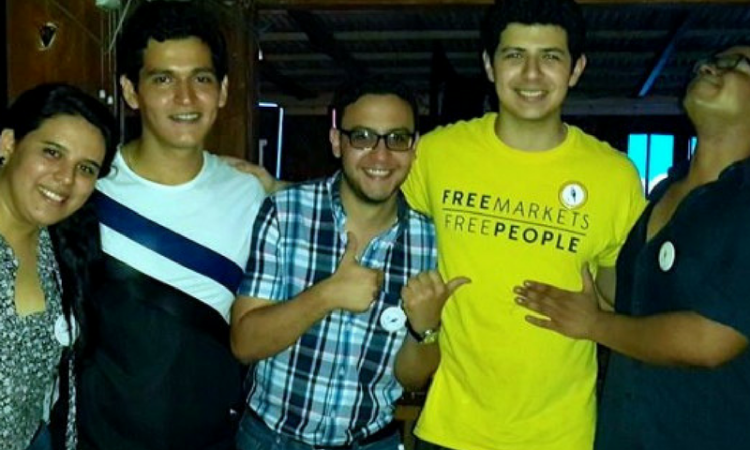 San Pedro Sula-based Jorge Colindres is a local coordinator for EsLibertad, the Latin-American wing of Students for Liberty, and he received the award in-person. He detailed the story on the PanAm Post blog in November 2014. After two overtly Marxist student unions had previously succeeded in closing the university for more than two weeks, he and his fellow EsLibertad members came to the aid of university administrators. In addition to metal cutters to remove the chains placed on various campus gates, the strategy was to stand in visible opposition to any new shutdown, and to recruit fellow students who just wanted to continue with their classes. To identify themselves, students wore EsLibertad badges, and an unaffiliated but prominent opponent of the shutdown soon joined their ranks. Colindres, who is also a legal analyst for the Eléutera Foundation, shared that they then ran out of badges, as their support swelled to more than 200 individuals and overshadowed the gathering Marxists. EsLibertad allies chanted “¡Queremos clases!” (we want classes), as another shutdown was being attempted. Post by Estudiantes por la Libertad Honduras. Despite a caustic standoff with brief skirmishes, the Marxist students eventually dispersed. The presence of clear opposition had undermined their claim to be representing students, and the successful initiative received an SFL nomination and positive press coverage from national daily La Prensa. The result also gave considerable pleasure to Claudia Amaya Martell, a lawyer and liberal political activist back in San Pedro Sula: “This is a young group, but they have demonstrated that concerted efforts can bring great results.” The president of the Federalism and Liberty Foundation Honduras says “the local work they do to defend liberty transcends borders,” and she both congratulates them and wants to see more peaceful dialogue and tolerance as solutions to conflicts. This article first appeared in the PanAm Post. Fergus Hodgson is executive editor of Antigua Report, a consulting firm and publication that connects the Americas. He is also the roving editor of Gold Newsletter in Louisiana, a research fellow with the Tax Revolution Institute in Washington, DC, and an economic consultant with the Fraser Institute in Canada. Previously, he was the editor in chief of the PanAm Post and director of fiscal policy studies with the John Locke Foundation in North Carolina. He has studied economics at Boston University, political science at the University of Waikato, New Zealand, and Cuban history at the University of Miami. His articles have appeared in online outlets such as the American Conservative, Daily Caller, Fox News, and LewRockwell.com, and in dailies such as the Charlotte Observer, Cleveland Plain Dealer, Sacramento Bee, and Washington Times.